As well as the 140 deluxe style rooms guest also have a choice of 30 gorgeous individually designed Suites. A few of them are mentioned below but please ask you ResortWorld consultant for further information on all of the suites available at Punta Mita. Located on an upper hillside in a building of its own, the spacious one-bedroom Luna (Moon) Suite provides dramatic views. You can enjoy Punta Mita's spectacular sunset from the private plunge pool in its ultra-wide patio. The suite's unique styling will give you the warmth and coziness of a luxurious Mexican home. Reservations for this suite includes a personal host to provide the highest level of service during your arrival and departure, as well as a daily poolside cabana in the Tamai pool complex. The living area and master bedroom open onto a 105-square-metre (1,129-square-foot) furnished terrace with sitting area and large private plunge pool. 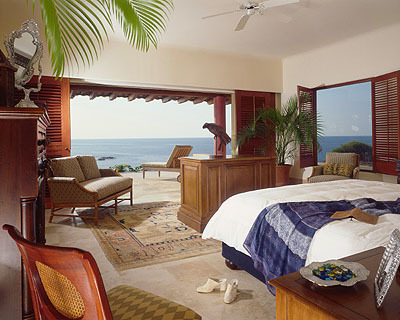 Hammocks are provided for the Luna Suite guests' private use. The living area includes sitting and dining areas with a pantry. Features include air conditioning and ceiling fans, large walk-in closet, in-room safe, two televisions, DVD and CD players, computer/fax connections, two-line telephones and high-speed Internet access. The full marble bathroom has a deep soaking tub, separate glass-enclosed shower, double vanity and dressing area. A guest powder room with shower is located off the living area. The suite also features an outdoor shower.